Rubber Curve bar expander roll is used for removing wrinkles from Textile Processing machines like Calendars, Dyeing, Bleaching machines, Rubber Bow Roll, Drying Ranges, Stenters, Bow weft straightener. Rubber expander bow/spreader rolls for removing wrinkles (creases during processing of fabric, paper, plastic, films). They are made as per application, considering the machine length, machine speed and material to be processed is called Rubber Bow Rolls. Bowed Rolls offered come in quality construction finish and support demands of effectively performing defined industry oriented functions. 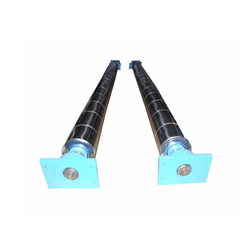 Further, these rolls also provide for safe usage and can be provided in the metal finish so as to provide for use in high-speed paper slitter rewinders. 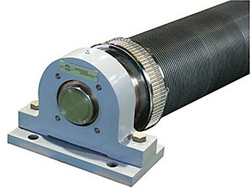 Some of its features include support the demands of wrinkle removing and post slitting to separate slits; come in heavy weight finish and extra pulley support for driving metal expander roll; support efficient removal of wrinkles from Textile Processing machines like Bleaching machines, Calendars, Dyeing, Drying Ranges, Bow weft straightener; have more abrasion resistance, chemical resistance, high temperature resistance due to presence of Nitril, Hypolan, rubber sleeves. Jointed Axle Rubber Bow Roll offered provides for optimum functional support and support the demands for wrinkle removal on tire-cord fabrics. Coming manufactured using quality materials, these rubber bow rolls match up with defined industry standards and feature high strength finish as well as superior durability. Some of its features include superior resistance to chemical, abrasion, and temperature; available in different specifications and at most affordable prices; available options include diamond grooved rolls, helically grooved rolls, straight grooved rolls. 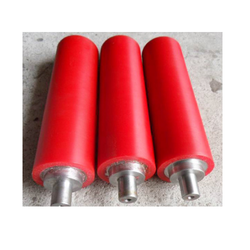 Rubber Bow Roller offered comes in quality construction finish and supports demands of removal of wrinkles from textile processing machines. Further, these also come supported by special sealing that allows these to work in wet working conditions. 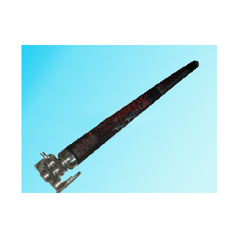 Some of its features include suitable for use in machines like bleaching machines, drying ranges, calendars, dyeing, bow weft straightener; coming with more bow than found in other industries like paper, plastic; nitril, hypo loan, rubber sleeve support for superior abrasion, chemical, and temperature resistance; come with bow angle adjusting worm-worm wheel gear box; available with foot/flange mounting as per specific process requirements.We are offering a wide range of Rubber Coated Roll. All the rolls are highly available in the market on effective cost. To order out a rubber roll for the best-desired application it is necessary to get the following details. Rubber Grooved Roll offered can be made available by us in different configuration choices and find suitability for handling of delicate films without any damage during wrinkle removing procedures. Here, our expertise lies in offering these rolls in various sizes and rubber type options. Some of its features include appropriate for all types of side sealing and bottom cutting machines; come with nitrile rubber base; available in all types of lengths and burning sizes; available in different choices as per specific requirement like diamond grooved rolls, helical grooved rolls, straight grooved rolls.